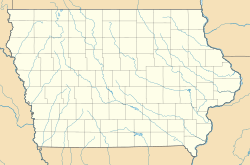 The Paul J. and Ida Trier House is a historic building located in Johnston, Iowa, United States. It is a Frank Lloyd Wright designed Usonian home that was constructed in 1958. It was the last of seven Wright Usonians built in Iowa. While it is now located in a residential area, it was constructed in an area surrounded by rural farmland. The Trier house is a variation on the 1953 Exhibition House at the Solomon R. Guggenheim Museum in New York. The north wing of the house was designed by Taliesin Associates and built in 1967. It was originally the carport, which was enclosed for a playroom. The present carport on the front and an extension of the shop was added at the same time. ^ "Trier House". SAH Archipedia. Retrieved 2017-09-21.